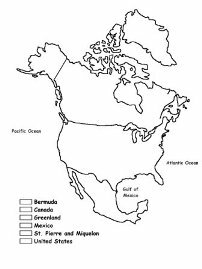 North America is the third largest of the seven continents. It is bordered by the Atlantic Ocean to the east and the Pacific Ocean to the west. 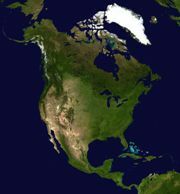 North America is dominated by its three largest countries: Canada, Mexico, and the United States. Central America and the Caribbean are usually considered part of North America, but they have their own section here. Although Columbus is given much credit as having discovered America, there were plenty of people already living in North America prior to the Europeans having arrived. This included many Native American tribes in the United States and the Aztec civilization in what is now Mexico. 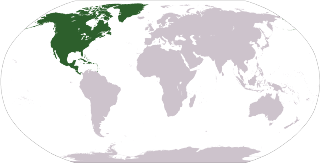 In the 1600's the Europeans quickly colonized and took over much of North America. The most populous country in North America, the United States, was formed in the late 1700's and became a "melting pot" of people and cultures from around the world. Color in this map to learn the countries of North America. Click to get a larger printable version of map.